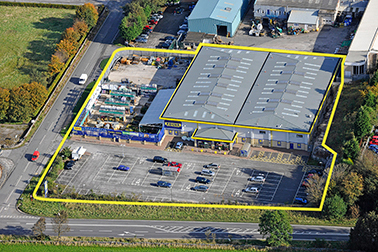 The scheme is located at the entrance to the busy Staden Lane industrial area with frontage to Ashbourne Road. The development comprises a 25,000 sq. ft. store together with a 10,000 sq. ft. external sales area and 100 customer car parking spaces. Re-development of a former chemical factory. The site levels required the removal of 25,000 m³ of limestone over a five month period and stabilisation of the resultant rock embankments. The scheme was pre-sold to F & C Asset Management.